Intersection of Nash and Pender. 1922 Sanborn fire insurance map of Wilson, North Carolina. Colored Baptist Church — Formerly home to First Missionary Baptist Church, by 1922 this wood-framed building housed Wilson Chapel Free Will Baptist Church. Wilson County Gin Company — A cotton gin. The main building later housed Faulkner Neon Company. 546 East Nash Street — In the 1922-23 Wilson city directory, this house is listed as the residence of several apparently unrelated people, including tobacco workers James Baker and James Green, helper Robert Hines, and laundress Easter Ruffin. 548 East Nash Street — J. Wesley Rogers, a porter at Oettinger’s department store, lived at this address. By the 1930s, this house had been demolished, and a fish market stood in its place. Law office at 550 East Nash Street — The 1922-23 Wilson city directory shows African-American attorney Glenn S. McBrayer‘s business address as 525 East Nash. Oddly, the advertising novelties concern of white businessman Troy T. Liverman and the office of African-American physician Michael E. DuBissette are listed at 550. Watch shop at 552 East Nash Street — Robert T. Alston ran a jewelry and watch repair shop at this location. Grocery at 556 East Nash Street — The 1922-23 city directory carries no listing for 556 East Nash, but at 558 there is the white-owned grocer Baxter & Company. Pender Street — In 1922, Pender Street ended (or began) at Nash Street. The dog-legged continuation across Nash was then called Stantonsburg Street. 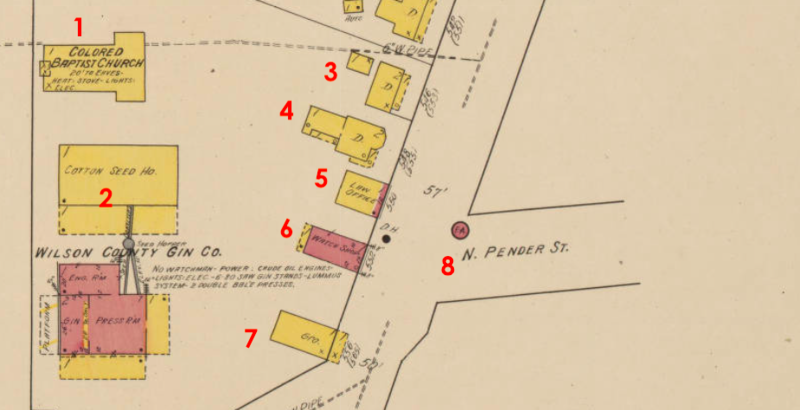 Much later, the course of Pender was shifted via an angle to meet Stantonsburg Street, and Stantonsburg was renamed Pender. ← Cherry Hotel and the color line.